Brahms' Serenade (Ständchen) from his 5 Lieder, Op. 106 has been arranged for viola solo and piano by the world-famous violist Donald McInnes, who held a professorship at the University of Southern California from 1985 to 2014 and is known in virtually every corner of the artistic world for his appearances with major orchestras, recitals, chamber music participation, and numerous master classes. The second of Brahms final three sets of "regular" song settings, Op. 106 demonstrates a gradual thematic motion from nostalgia toward regret. It utilizes more ternary (ABA-type). The Serenade, the first song in the set, shares its title with a previous song but uses different text. It is a very realistic musical evocation of the serenade it describes. The solo melody is gracefully arching and deliberately nostalgic in character, but the signature "strumming" in the piano accompaniment suggests an ever-present ache of regret. 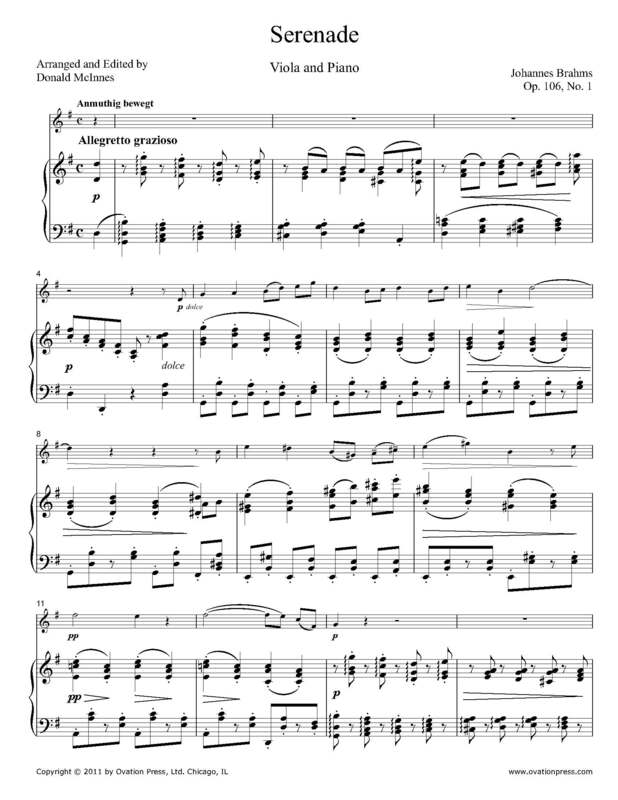 Download and print the score today to gain access to this expertly edited arrangement of Brahms' Serenade (Ständchen), Op. 106, No. 1 for viola and piano by Donald McInnes! und lispelt: "Vergiß nicht mein!" So fitting for love-struck people.